By Ron, February 27, 2013 in Pop Quiz! Time for another quiz since it seems to be slow on the Board. The first civil war related monument ever erected. 4. Desribe the present day local settling of the monument. Correct present description of the monument and the local setting. 5. What was the local name of the terrain feature where this monument is, at time of its importance? Correct Answer 25 points. Cash prize of $100.00 to the first person to get 150 points of correct answers. This is the only hint you will receive so get it right. The monument is still in its original place and is east of the Mississippi River. Your Loyal Honest Quiz Master. 1: It was erected to "Commemorate The Death Of Those Who Perished In Suppressing The Southern Rebellion." 3: Located in a churchyard. 4: Corner of Sheldon Ave. and Percival St., Kensington, Conn. Thanks Ron, for the generous prize of $150 for the first 100 points. First off, shouldn't this be quiz #14? Second, this test is rigged. You only asked 125 points worth of questions! Yes, this should be quiz #14, and you get 5 points for noticing the number. As to the 125 points for correct answers for a 150 point prize, well that is a slight technicality. Ran out of questions to ask. Having trouble verifying your information, get back later. For discovering your "slight technicality" you should award me 20 more points, for a total of 25. I'll sell you my points for a $1 a point, should Ron decide to do the honorable thing and give me the extra 20 pts. Do you accept Confederate money? Darnit. I'll turn my printer back off, then. Counterfeit Confederate money. Somehow that sounds redundant. 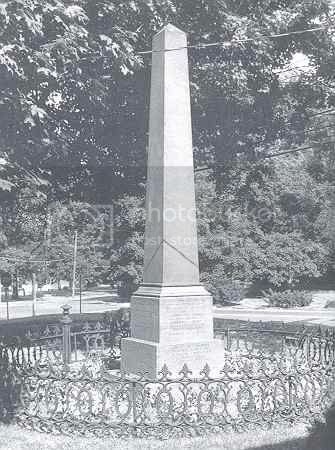 The correct answer is the monument erected by Hazen's brigade for their fighting at the Battle of Stone's River. The brigade members built it in 1863 and is reported to be the first monument built in the US. The monument mentioned in Kenningston CN seems to has unresolved questions about it. I believe it was moved from its first location. Ron: yeah - I thought that was the 1st one. That is what I would have said if I had of made a timely response.